The new Mall del Sur is the largest mall in Peru. The multiplex’s grand opening was June 22, 2016. Cineplanet is the first cinema operator in Peru to install Barco’s new premium Flagship laser cinema projectors, offering patrons an unprecedented premium cinema experience while reaping the rewards of greater operational efficiency. 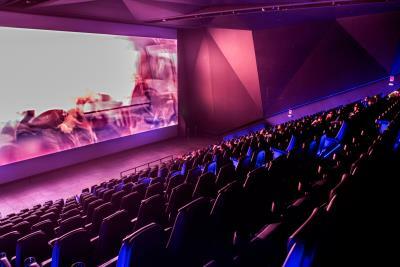 Bardan Cinema, one of the largest cinema integrators in the Americas, was involved with the project’s visioning, design and installation of the audio, projection, seating, screens, lighting and concession equipment. perfect for all large cinema applications, such as movie houses, museums, universities, etc. Approaching its 30th anniversary in 2016, Severtson Corporation continues to be a global leader in innovation and quality. The Severtson family’s extensive experience in manufacturing small home theater screens and large cinema screens has given Severtson Corporation the expertise to meet the needs of the professional and consumer AV markets for both indoor applications as well as large outdoor venues. With its three Arizona-based production facilities and its state-of-the-art robotic application system, Severtson has massive production capabilities and an unusually wide array of screens. The screens range in size from massive movie theaters, comfortable home theaters, and everything in between.